TeacherDance: Reading Time This Week-Terrific! It's Monday! WhatAre You Reading? is a kidlit meme hosted by Jen and Kellee at Teach.Mentor.Texts. Come visit! And also visit Sheila at Book Journeys to find reviews of all kinds of books for adults and for children. 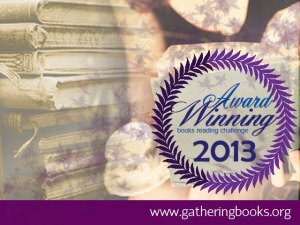 I also participate in the award-winning books reading challenge sponsored by Myra, Fats and Iphigene at The Gathering Books blog. It’s Poetry Month, and here at Teacher Dance on Mondays each week, I share the books I’ve read in the past week. 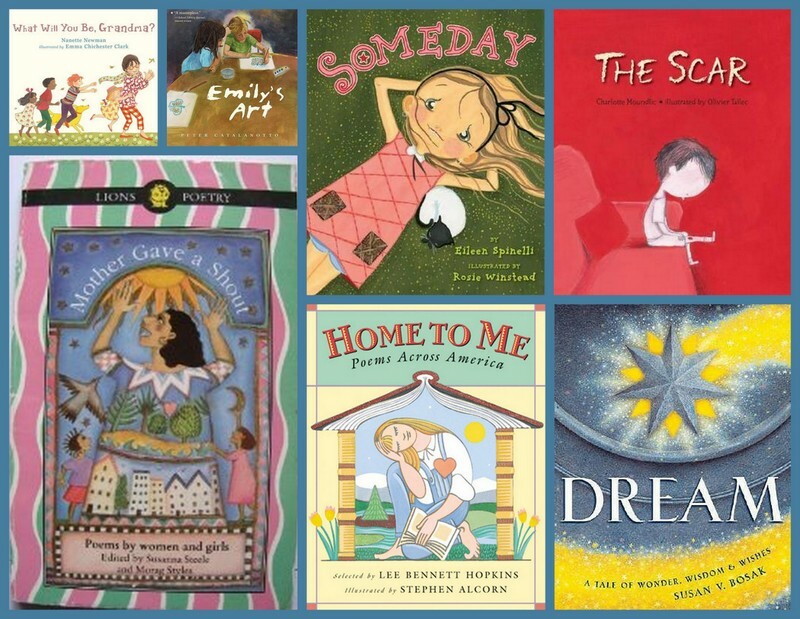 This month, I'm sharing some poetry anthologies for children that I enjoy, old and new. Don't forget to look to the right to see whose turn it is to add a line to the 2nd Annual Progressive Poem, the idea created by Irene Latham at Live Your Poem. Then head over to see how it's going! Nearly complete! And visit Mary Lee Hahn at A Year of Reading, and her wonderful April posts/poems. Home To Me, Poems Across America – selected by Lee Bennett Hopkins, illustrated by Stephen Alcorn. I found this book (dated 2002) in our school library. Its poems by numerous authors like Janet S. Wong and Rebecca Kai Dotlich can be used to illustrate both the physical home and the home that people love because it connects to one’s heart. Dotlich writes of the prairie: “I breathe in stories/told to me;/when winds came calling,/a fine dust falling” and Wong of living above Good Fortune (a restaurant) on a street “where every other thing is Lucky/and every other other thing is for tourists”. There are homes on islands, by the sea and on the sea, along with the “Rez” and the desert. It’s a book full of love and stories, including the illustrations which are colorful and dream-like. I discovered a new, used bookstore in my neighborhood Saturday, and enjoyed my visit immensely. I found several good books, among them this anthology, published in 1990. It is wonderful, so richly filled with poems from so many marvelous poets, like Gwendolyn Brooks, Nikki Giovanni, Eve Merriam, Emily Bronte, Sara Teasdale, Jane Yolen, Alice Walker, some in the traditional Native American, some translated, and some from children. It is terrific, and still available used on Amazon if you’re interested. A friend of mine found this book and loaned it to me, saying it was ‘for’ me. It’s a lovely story of a little girl, Lily, and her grandmother. They banter back and forth guessing what might be a good career when Grandma grows up, like “paint rainbows on children’s faces.” The guesses become more fun as the book moves along, and continue throughout the book until the sweet ending. The illustrations are beautifully colored drawings. How have I missed this book for us to have at school. We've needed it through the years to share with certain children. It is a French author, and evidently just came out translated into English two years ago. It tells the story of a little boy whose mother dies, and the challenge and the worry for the future. The boy worries that his father won't know what to do or how to fix special toast for breakfast. Children are definitely more direct than adults, so this says hard things about how sad the boy is, and then, how very angry! I would keep it on our library shelves, but it's not for every child, just those who will need it. There is a school art contest. Emily’s classmates already know that Emily is a good artist, but the person who is a judge thinks otherwise, and gives the prize to another young artist who draws beautiful butterflies. The disappointment is very real, and the realization that no one can say who is the best but oneself is truly a good end to this interesting story, i.e. beauty really is “in the eye of the beholder”. I know it will bring a good discussion about choosing “best” things and who gets to choose. A young girl imagine wonderful things about what she will be “someday” and then Spinelli also lets us see the reality of the girl’s life in contrast. For example, she dreams that someday she will ‘make friends with a dolphin and call her Wilma, who will tell her all the secrets of the sea.’ In her life, she shows off her goldfish, gives it a sprinkle of food, but he doesn’t say anything, just blows bubbles.” Illustrations are beautifully full water-color pages, rather cartoon-like, and the coloring is bright and cheerful. It’s an exuberant book. Is this a poem? I think it is, of someone’s life, who began, was lost, and came back to her dreams again, as the sub-title says, a tale of wonder, wisdom and wishes. Susan Bosak begins as a baby, like all of us, and takes us to old age, with gorgeous illustrations by fifteen terrific illustrators sharing their own visions of her words on each double-page spread. There is an added bonus of hidden stars on each page, inspirational quotes, more information at the back about the illustrators, and a further connection to The Legacy Project with activity guides and more. This is a book that could be useful in every classroom. COMING: Almost finished with The Runaway King by Jennifer Neilsen (wonderful), and think I will read Hold Fast by Blue Balliett next-lots of great talk about it! I just finished the Runaway King and was thinking of Hold Fast for this week also. It's been close to the top of my pile for a while and I keep pulling other books ahead of it. I'm excited to read about Dream. Unfortunately, my copy is in Florida, so it'll be a summer book. Thanks for all of the great recommendations! Wow-I think we're being influenced by the group, right? I'll be interested in seeing what you think of Hold Fast, & your recommendations today, too. Runaway King and Hold Fast are both fantastic! I enjoyed both so much! I see that you zipped through False Prince and right onto Runaway King! I love your great poetry resources! Thanks for joining in! I love reading everyone's book choices Jen-you & Kellee have started a good community for sharing. Almost the end of poetry month, but I'm sure I'll continue with some poetry on some days! Thanks! Linda - So pleased you found and liked Emily's Art. A real favourite of mine - Just a note it is written by Peter Catalanotto (not Emily as you have above) He is a brilliant illustrator - love his work in Book (by Georges Ella Lyons) Enjoy The Runaway King. My children and I love this trilogy! Thanks for catching that mistake Carrie-oops! Yes, going to finish The Runaway King by tomorrow-can't stay up much later tonight! It keeps twisting and turning! Now we'll have to wait! And, I'll look for Book, too! Enjoy finishing The Runaway King! I loved that and Hold Fast! I didn't realize how many awards Dream received, such a fantastic book, wonderful to know, thanks! Thank you! Hope you have a great reading week!